We do not get many blues CDs from Austria to review, so it was neat to get a retrospective release from Katie Kerns to listen to. Katie is a fine guitarist and singer from Vienna, and has been a fixture on the Austrian blues scene for 20 years. She gigs regularly and has a handful of solo albums, as well as a few discs that she cut with the Rocking Birds. Kern’s latest release, Blues for the Highway, is not actually very new, as you will soon see, but it gives a good perspective of how she got to where she is today. Katie grew up in a household that appreciated the finer things that humans can do; both of her parents were art teachers, and her father was a fine pianist who taught her when she was young. The blues bug bit Kern in her early twenties, and she grew to have an affinity for classic material from the genre. She counts Bonnie Raitt and Mississippi John Hurt among her influences, and she continued her blues education with the fine folks in her hometown music scene, and started playing out in 1998 at the club Papas Tapas. The album we are looking at today, Blues for the Highway, is actually a live album that was recorded at the Bluesman Café in Vienna on December 22nd, 1999. Kern played the guitar and took the lead vocals, and was joined on stage by Hannes Kasehs on guitar, Reinhard Dlapa on drums, and Christa Kasehs on the bass. Katie’s former husband, Peter Kern, joined in on a few tracks with his guitar. This is not the world’s best produced live album as there is no crowd sound to be heard and the mix is not terribly even, but high-quality live sound recording technology was not as readily available to the common man twenty years ago. The reason that this disc was released nearly two decades after the show was recorded was so that Kern could give listeners an idea of what influenced her choice of genre, and from the material it is apparent that she has an appreciation and knowledge of the finer points of straight-up blues. 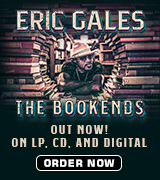 There are 13 tracks on this album, and it is an interesting mix of standards and originals. Katie begins this club set with the title track, and “Blues for the Highway” is a good indicator of what is to come. On this converntional blues tune Kern’s voice is strong (with a bit of an edge) and her leads are tasteful. Adding to this, Hannes Kaseh’s rhythm guitar work is clean and the backline of Reinhard Dlapa and the Christa Kaseh is spot on. 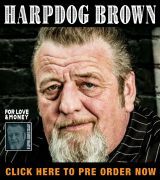 This is backed up with an instrumental jam, “Tribute to Magic Slim,” a series of 12-bar guitar solos that are presented in a dizzying array of keys – I do not know how they kept this one together, but the band remembered every key change! The covers are diverse selections, and the standout of these is “Wait on Time,” which can also be found on the Fabulous Thunderbirds’ 1979 album, Girls Go Wild. This version is a bouncy 12-bar romp that is a little more stripped down than the other songs in the setlist. This highlights Katie’s guitar soloing, which is especially clean with sharp attacks and tight phrasing. Bobby Troup’s classic, “Route 66,” also makes an appearance. This song has been re-done so many times, but Katie gave it a jazzy twist so it is not a tedious chore to listen to. The set closes out with “Bricks on My Pillow,” which is Katie’s electric take on Big Bill Broonzy’s song from 1935; it does not lose any of the jaunty feel of the original, and this is a fun way to end her show. 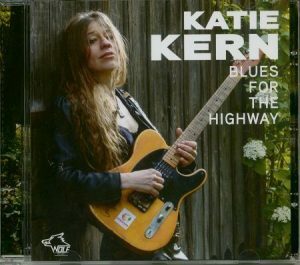 Blues on the Highway is an interesting release from Katie Kern, and it is fun to hear where she came from and to listen to interpretations of her influences. If you want to see what she is doing now, you can head on over to her website, but make sure you brush up on your German first as there is no English translation!